Not only was Monamy not a "slavish" follower of the compositions of van de Velde or anyone else, he was in many ways an original, new and experimental painter in his own right. This may have been partly fortuitous, arising from his training in English sign-painting, but that is no reason why his originality should not be recognized. Monamy is a unique phenomenon in English painting, and, it bears repeating, the painter who made the greatest contribution to the foundations of the genuinely English School of the 18th century , mainly, though not exclusively, concentrated in the marine genre. 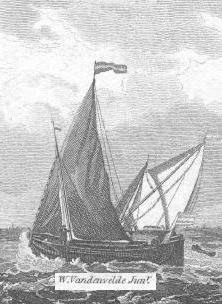 The roots of English nationhood, a concept widely perceived today as writ in water, always lead back to the sea. Some aspects of his work have more in common with the 20th century than with his own age. Michael Robinson's intense devotion to the van de Veldes stemmed, in my view, from his admiration for their draughtsmanship. The Elder excelled as a draughtsman, and the Younger built on the foundation of his father's skill in drawing by even greater excellence in the application of oil paint and colouring. Michael's appreciation of art in general was limited to this aspect. He was virtually immune to the appeal of any other painters, and found it difficult to mention Bakhuysen, Dubbels or Capelle without a note of unvoiced contempt. Turner was a name he uttered with near-abhorrence. The perception of graphic accuracy as a matter of overriding importance is very common among marine art connoisseurs, especially in England, but, for myself, I find it a rather one-dimensional approach. There is little evidence, on the other hand, that Monamy took much interest in draughtsmanship, per se; and plenty of evidence that he made free use of prints and drawings by other painters and engravers. At his death he had a "collection of prints and drawings, amongst which (were) many of William Vandervelde, Senior and Junior", as advertised by the auctioneer ---- to attract the punters. The drawings of the van de Veldes were obviously only one of several aids that he used. As a sign-painter he would have had little basic training in perspective, whether linear or isometric, since a sign-painter's prime objective is communication, not photographic or "optical" represention; and this kind of accuracy was not his main interest, as it wasn't for the later Turner, or many other painters recognized as great. Leaving aside his calms, it seems to me that among Monamy's main aims was the expression of energy and sensation, which he achieved in several different ways. The composition of the Signal to Anchor, above right, is discussed at length here. It seems to be stylistically linked with the Royal Occasion at present in Buckingham Palace, here; and the two pictures are juxtaposed above, as they appear to have a pyramidal background structure in common. 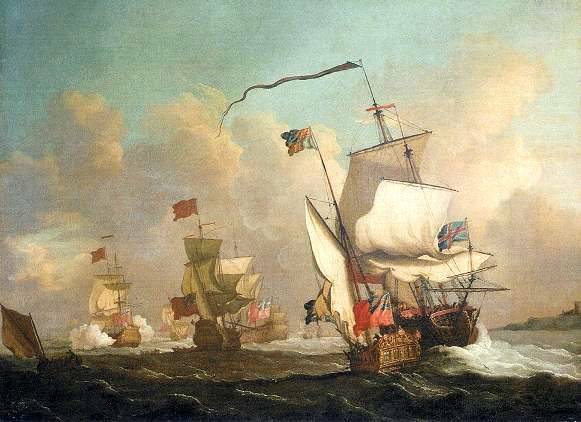 It would also suit.a conjectural dating of the paintings to have them painted within a year or two of each other, since the Royal Occasion appears to me to be connected with the accession of George II in 1727, and the Signal to Anchor with the fleet review in 1729. The sensation aimed for here is strength and triumph. As an aside, I found it interesting to learn that Kubrick, when discussing the design of the imaginary War Room in Dr Strangelove, asked Ken Adam, its designer, "isn't the triangle the strongest geometrical form?" Ignoring the contextual implications of the question, one can only add that if the triangle is strong, what of the tetrahedron? The left-hand half of the extremely vigorous painting heading this page has some slight echoes of van de Velde. Until someone convinces me otherwise, the right-hand half has no such echoes. The juxtaposition of the ship and the yacht seems to me completely original, as does the dynamic effect produced by seemingly having the main vessel leave the frame, in the same way that the yacht appears to have just entered it from the spectator's space. 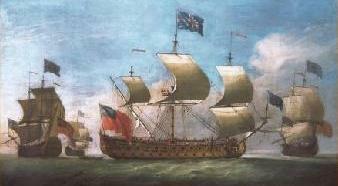 The similarities between this untitled picture, above left, and the East Indiaman have already been noted, here. 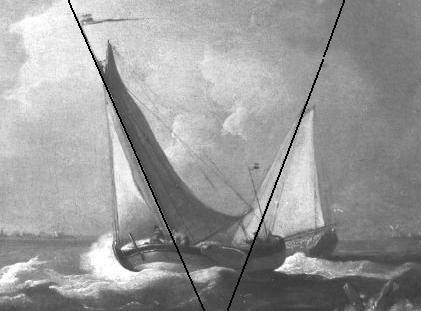 The treatment of the sails, and the quarter angle of the starboard bow view of the principal ship are obviously closely related. 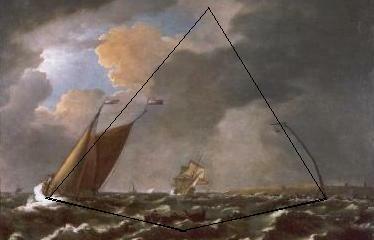 There also appears to me to be a similarity in the conception of the composition: both these ships are exiting the box. Assuming that these paintings are in fact both by Monamy, I would take it that the left hand canvas predates the East Indiaman. Archibald wrote that this painting was "traditionally" thought to have been one of the Vauxhall Gardens paintings, and that perhaps it had formerly been more widely extended to the right. Neither of these ideas seems probable. Spurious "traditions" spring up from nowhere: the Signal to Anchor is "traditionally" referred to as the Queen of Portugal's Visit, a "tradition" which originated in 1934, and in the inventive fancy of the exhibition organiser, as Michael Robinson confided to me was probable, when I raised the matter with him. 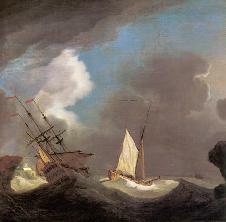 The Royal Yacht in a Stiff Breeze, by the "Flemish artist" is exceptionally dynamic. In my view the sense of movement and exhilaration is achieved by a very deliberate attention to its composition. As Hogarth remarked, "if (ships are) copied exactly as they chance to appear, the painters have no occasion for judgement". Monamy's judgement has been exercised in this painting. A variation in judgement is illustrated by the painting below. This painting, inaccurately called Dutch Yachts Racing, achieves its effect of motion and speed in a different manner. By driving a compositional vee, or inverted triangle, like a wedge between the vessels, they are forced apart. In spite of the fact that they do not both appear to me to be yachts, and are surely not racing, they seem to be positively accelerating away from each other. This kind of dash and vigour is light-years ahead of anything Scott ever produced. See also Heeling Right to Left. Dutch Yachts Racing, with its coastal windmill and Dutch flags, is undeniably one of the most explicitly Dutch of Monamy's paintings. 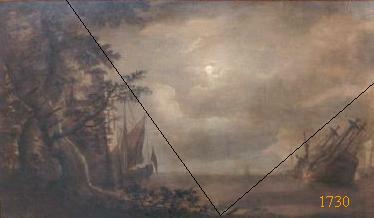 It might well be that in this picture he was acknowledging an indebtedness to the Dutch School in general, and possibly that he had some painting of van de Velde, such as the one here, and right, in mind. If this little painting is in fact the inspiration for Monamy's picture, and its engravure suggests it might be (if it isn't by Monamy in the first place), then the differences, I submit, are infinitely more interesting than the similarities. The earliest known paintings by Monamy, at left, appear to fore-shadow the mannerisms proposed above. 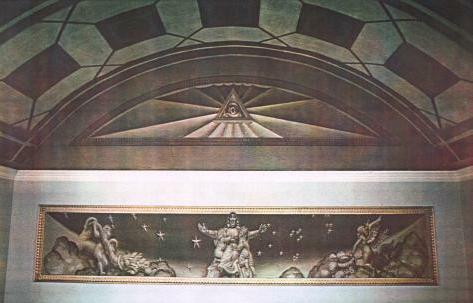 The upper painting has a hint of the later more firmly explicit pyramidal structure. The second painting was ridiculed by a very unpleasant woman who attended the opening reception of the 1983 Chichester exhibition, because, as she scornfully put it, the wherryman was "falling out of the picture". In my view it is precisely this sense of the picture's content entering the spectator's space which gives it life and originality. Perhaps I am alone in my subjective experience. The two pictures to the right also seem to have compositional features in common with those discussed above. Perhaps I'm making too much of all this. Sea views, unlike landscapes, and unless seen from an aerial or mountaintop viewpoint, almost inevitably have flat and horizontal horizons, to coin a phrase. 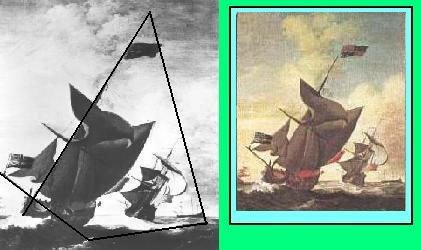 Is a painting with one large ship and one smaller ship just bound to have a triangular structure? Not always. Look at the two paintings below. The picture, right, struck me as experimental when first seen. 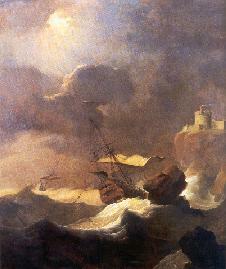 Both it and the beacon painting feature a ship leaving its own space. The compositional originality of these two paintings is discussed here and here. Winston Churchill was one of the Honorary Elder Brethren of Trinity House. He delighted in their uniform. Wearing it "after the War at a victory celebration in France .... it greatly intrigued his French hosts. Asked what it was, he replied with pride: 'Je suis frère aîné de la Trinité.' Which prompted a Frenchman present to murmur: 'Mon Dieu! Quelle influence!'" Quoted by Fred Majdalany in The Red Rocks of Eddystone, 1959, p.13. "Monamy ...... exhibited his works in the window of his shop, to the delight of the sons of Neptune, men and boys, who were seen in crowds gazing at his wondrous art." William H.Pyne, Wine and Walnuts, 1823. His paintings frequently spoke to a common, vulgar market. This would have seriously worried aspiring Mr Walker, who could feel the warm breath of the van Dyck Club on his neck. "..... judgment ..... lies ..... in separating carefully, one from another, ideas wherein can be found the least difference, thereby to avoid being misled by similitude, and by affinity to take one thing for another." Book II, Chapter XI, para. 2; An Essay Concerning Human Understanding, John Locke, Fifth Edition,1706. Click here for full context. It is hoped that judgment does not necessarily exclude wit.